Ugh. I’m constantly reminded about how grateful I am that social media sites did not exist when I was a teen. The internet barely existed, at least for the general population. We paid for internet by the minute and what the heck is wi-fi? The reason I’m grateful for this lack of social media when I was a kid is also the absence of over-sharing and the glorification of stupidity. I may have done some dumb things as a kid, but there was an incredibly slim chance I’d end up as a hot news topic for anything I did. We didn’t want proof of our bad decisions and we certainly did not want anyone else having evidence, especially parents, teachers or future employers. I also don’t envy the social media staff for airlines right now with the latest teen trend of tweeting threats to airlines. What was originally set up as an additional form of customer service for travelers has become a playground for mischievous teens trying to be funny and having no idea what problems they’re causing by tweeting terrorist threats to airlines. Quite possibly the dumbest decision of Sarah’s life so far, on display for the world to see. 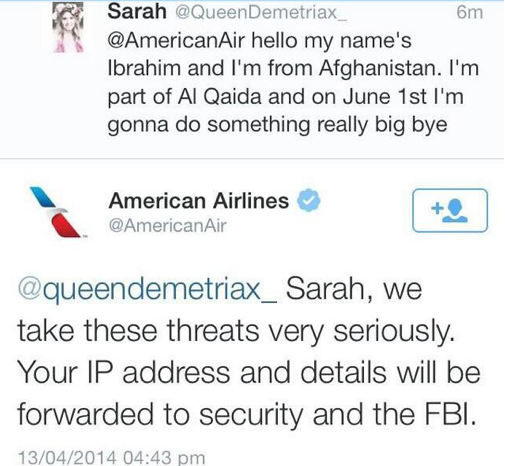 It started with a Dutch teen named “Sarah” tweeting a threat to American Airlines and the airline taking it seriously. Because it was a threat. The tweet hit the news and Sarah’s twitter account blew up with re-tweets and thousands of new followers. Perhaps other teens saw the instant celebrity status and followed suit, also throwing out threats to airlines. Either way, this is not funny and needs to stop because it’s taking time and resources needed for actual emergencies and threats. Imagine if while authorities were investigating a fake threat that a real threat slipped by. Just like 911 shouldn’t be pranked, threats to any business also should not be pranked. There’s no way I can get in trouble for this because I’m obviously joking. Obviously. What are they going to do, arrest me? Yes, they will take it seriously. Yes, you will be on the news around the world (the more people to help turn you in to authorities, my dear). No, it’s not obviously you’re not a terrorist – anyone can create a Twitter account and steal a photo off the internet to assume another identity. No one has any idea whether you are who you say you are. Yes, they will arrest you. Just like they arrested the first girl who got famous for tweeting terrorist tweets to an airline. Oh yeah, within days of her joking terrorist threat to an airline, aspiring celebrity Dutch teen “Sarah” aka @queendemetriax_ aka “Ibrahim” was arrested. While it’s not unusual for teens to build their celebrity through social media (i.e. Justin Bieber was discovered through YouTube) this isn’t the way you want to do it. Imagine a few years from now when Sarah is applying to colleges or for jobs and they recognize her appearance or name. Then they realize she’s the teen who tweeted a terrorist threat to an airline. If up against equally qualified candidates, would they want to hire her? What will her children and grandchildren think? When you’re young, it’s hard to imagine all the repercussions of our actions, so on one hand, situations like this help demonstrate “what’s the worst that could possibly happen?” Situations like these show what not to do and should not be seen as ideas of things to do. Make sure the young people in your life understand the difference. Previous Previous post: Are You Documenting Your Procedures? Don’t Be Left Clueless When Employees Leave!